The World Trade Center Orlando (WTCO) was incorporated in 1990 and has become part of a growing network of more than 300 WTCs in 100 countries around the world. Since WTC services are reciprocal, our members can take advantage of trade information, education and networking services provided by any and all active WTCs. 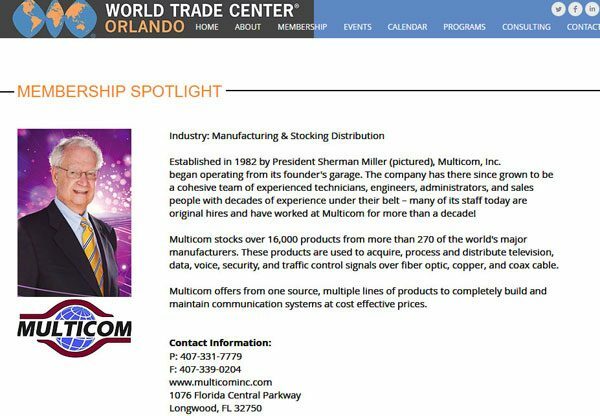 This month the World Trade Center Orlando has announced that its ‘Membership Spotlight’ will be on Sherman Miller, President and CEO of Multicom. Sherman is also long-standing member of the WTCO’s Board of Directors.